And if you live anywhere near me: happy SNOW DAY. Given the weather, I’m typing this post from the cozy comfort of my bed. Fuzzy pajamas and all! Between the hypnotizing snowflakes dancing outside the window, the strong espresso in my cup, and the tiny chocolate pie resting just inches from my fingertips, I feel like I’m totally winning this morning… and it feels DARN good. 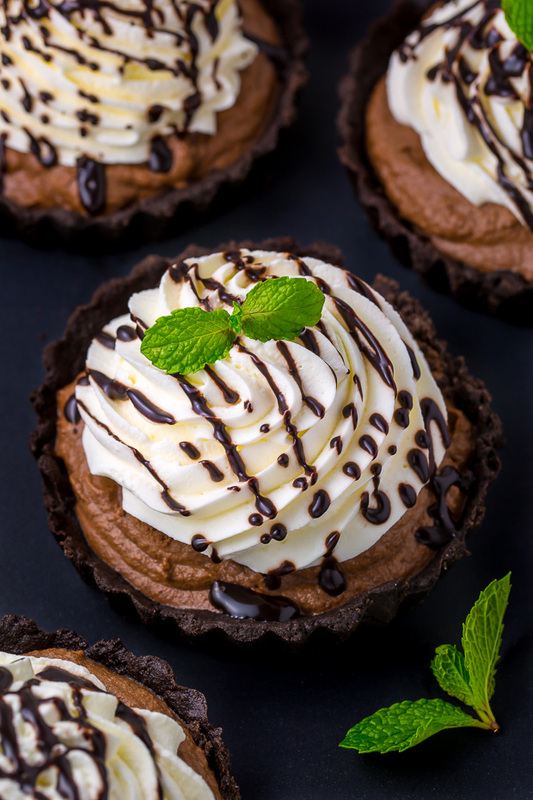 Let’s get some mini mint chocolate cream pies in your life so you can join me, OK? 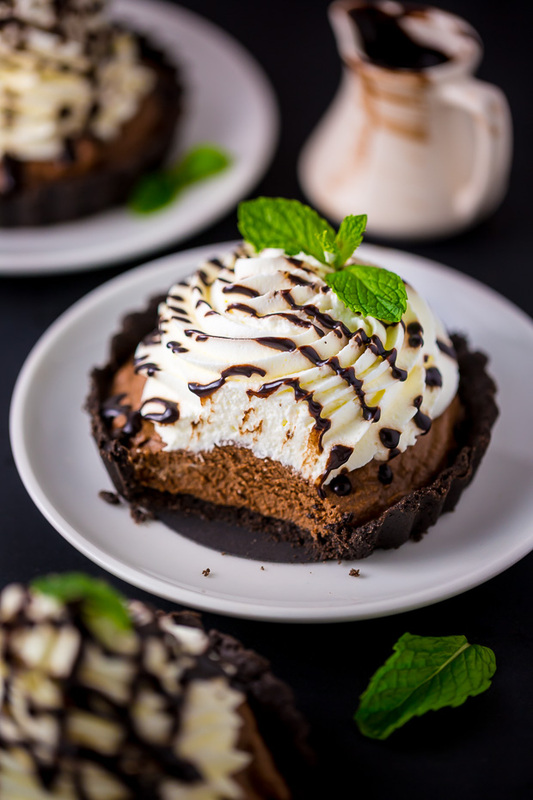 We’ll begin by breaking down these mini mint chocolate cream pies – layer by delicious layer. Starting with the crust! Which is made from Oreo cookies and butter… so you know it’s going to be delicious. 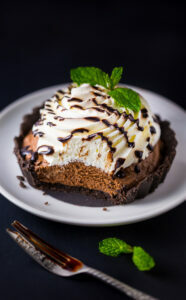 Next up, we have our decadent mint chocolate mousse filling! It’s rich yet fluffy, and loaded with flavor thanks to bittersweet chocolate, mint extract, and espresso powder. Finally, we’ll top the mousse with a giant swirl of homemade whipped cream, and finish it all off with drizzle of mint chocolate ganache. This pie is mainly made up of chocolate – so use the best stuff you can get your hands on! I strongly suggest using quality chocolate you know melts well and tastes good. I love Lindt 70% cocoa bars for this recipe! Whatever brand you choose, just be sure you’re using real chocolate, and not chocolate chips. For the best flavor, be sure to choose bittersweet chocolate or semi-sweet chocolate. I don’t recommend using milk chocolate, which will yield a cloyingly sweet filling. 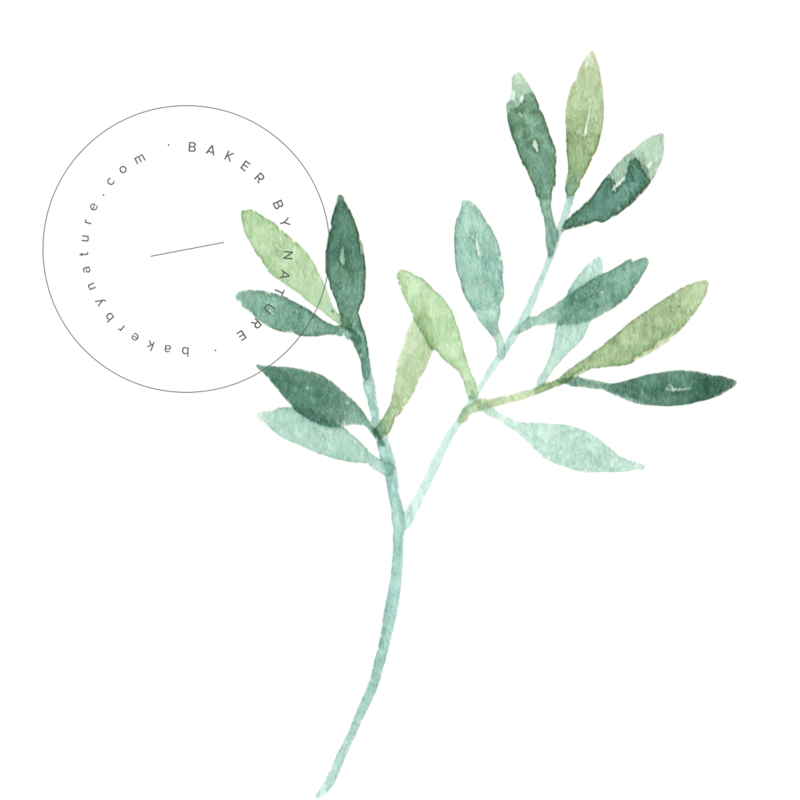 I LOVE this mint extract!!! 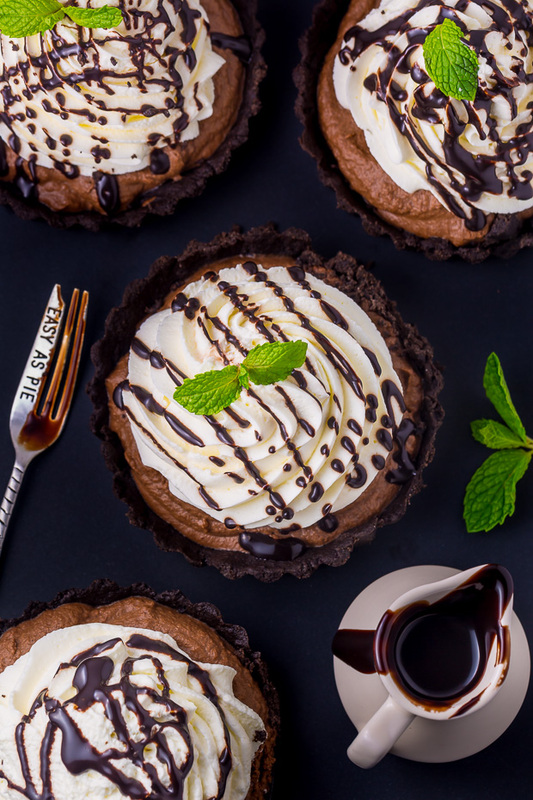 The crust for these mini mint chocolate cream pies is made from crushed Oreo cookies and melted butter. You do NOT need to remove the filling from the Oreo cookies before crushing them up. When it comes to crushing up your Oreo cookies, you have a few options. If you own a food processor or high-powered blender, you can simply place them in the body of the machine and pulse until the cookies are in fine crumbs. You may also crush them manually, by placing the cookies in a large ziplock bag, and rolling over them with a rolling pin or wine bottle. Just make sure all of the cookie bits have been finely crushed! Otherwise they won’t hold together. It’s very important to freeze the crusts for at least 30 minutes before you add the filling. Once you add the filling, the mini pies will need to go back in the fridge for at least 2 hours. So be sure to plan ahead time wise. Not a fan of mint? No problem! 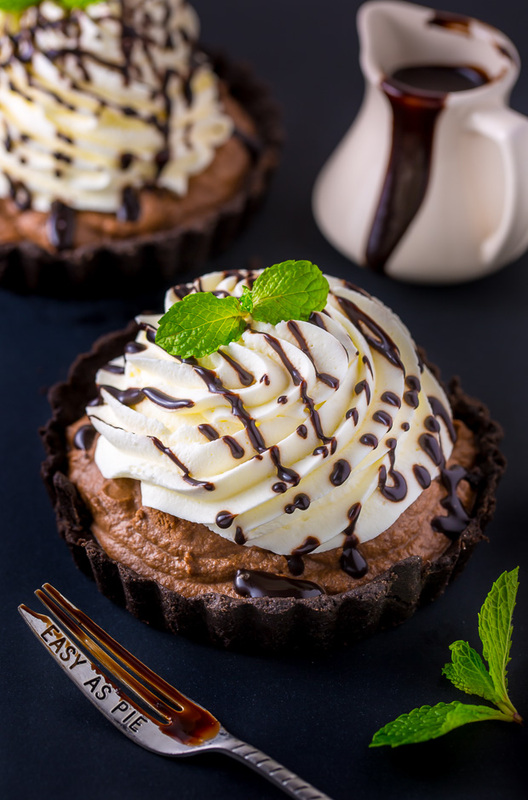 Simply omit the mint extract wherever it’s called for, and you’ll have chocolate mousse tartletts instead! I DO suggest using the espresso powder no matter what! It won’t make your dessert taste like coffee – promise! It just adds a really nice depth of flavor and makes the chocolate POP a little more. You’ll need mini tart pans for this recipe! 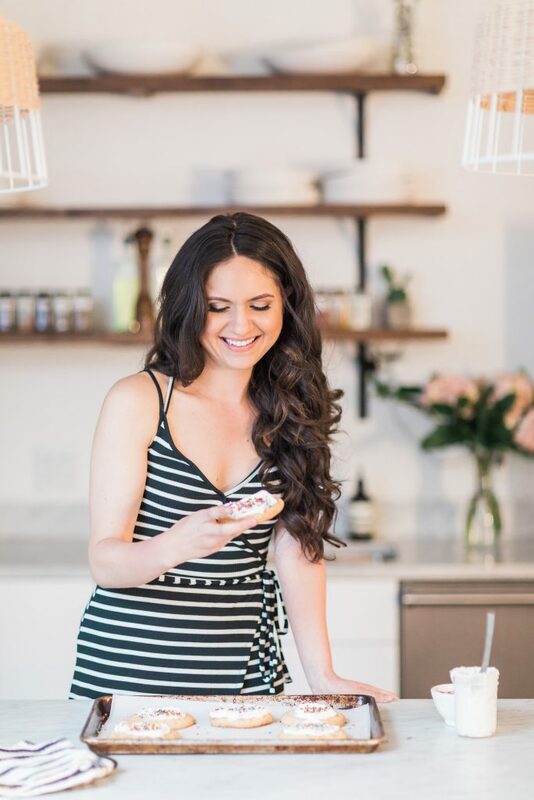 Click here to check out the ones I’ve been using for the past 6 years; I love them because they’re sturdy, easy to clean, and affordable. While I have not personally tried making this recipe in a full size pie pan, it should work in an 8″ or 9″ regular pie dish. P.S. I pipped my whipped cream onto the mini pies using the open star tip in this kit. You can also just dollop it on with a spoon. You can top these individual chocolate pies with fresh berries (this will be an especially nice choice once Summer rolls around), a dusting of cocoa powder, a simple sprig of mint… or nothing at all! 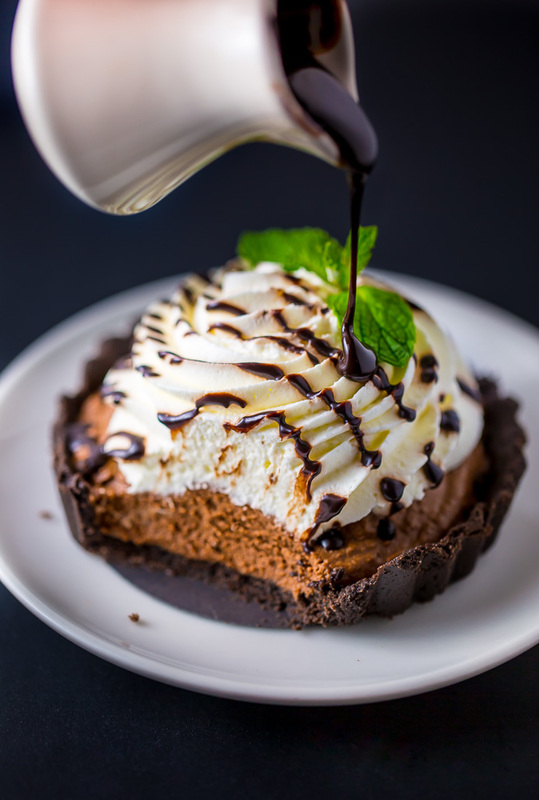 These mini mint chocolate cream pies are truly stunning “naked” and trust me, after your first bite the last thing you’ll be thinking about is garnish 😉 I can’t wait to hear how you enjoy this one! In a large bowl combine Oreo cookie crumbs and melted butter, mix well to combine. Divide the filling evenly among 6 mini tarts pans, then firmly press it into an even layer through the middle and up the sides. Place crusts in the freezer for 30 minutes. In the bowl of a stand mixer fitted with the whisk attachment, beat the heavy cream and confectioners' sugar on medium-high speed until soft peaks begin to form. Add in the cooled chocolate and continue beating for another minute or two, or until the chocolate has been fully incorporated and the texture is medium-stiff peaks, scraping down the sides of the bowl as needed. Divide the filling evenly among the Oreo cookie crusts. Chill for at least 2 hours in the fridge. In a large bowl using a handheld mixer, or in the bowl of a stand mixer fitted with the whisk attachment, beat together the heavy cream and confectioners' sugar until soft peaks are formed. Beat in the peppermint extract. Dollop whipped cream on top of each mini pie right before serving! Place chopped chocolate in a wide and shallow heat proof bowl. Heat the cream in a small sauce pan over medium-heat. Bring to a boil, watching very carefully as it will happen fast. When the cream has come to a boil, remove from heat and pour over the chopped chocolate. Allow the cream and chocolate to sit for minute, then whisk completely smooth. Whisk in the peppermint extract. Let the ganache cool for at least 15 minutes before you drizzle it over the whipped cream. Top each pie with a few fresh mint leaves. For best results, mini pies should be topped with whipped cream and chocolate ganache RIGHT before serving. I think you’ve forgotten to mention to add the Peppermint extract in the Chocolate mousse. I re read the recipe 3 times over. Hi Sharmila. It’s in step 4 – at the very end 😉 You add the peppermint extract once you’ve removed the pan from heat, but before you set it aside to cool. Hi Sharmila. Did you see my comment above? Please see step 4 in the method 🙂 That’s where you add the 1 teaspoon of peppermint extract. I hope that helps! I can see where the confusion is regarding when to add the peppermint extraction to the chocolate mousse. While Step #4 above (online) states to add the peppermint extract, the printed version doesn’t include this step. I was confused too. I referred back to your online instructions to find out what I do with the 1 teaspoon of peppermint extract in the Chocolate Mousse filing. It’s added in Step #4 as noted, but, again, this is not shown on the printed version for some crazy reason. These pies were delicious. They were extremely rich. When I make them again, I’m going to try to make them 1/2 the size. It’s almost impossible to eat all at once. Thanks for your posts. I’m enjoying your recipes. Oh my lord these pies are stunning. I love them. And Michael and I are big choc/mint fans so I need to make these asap! Hey there! These look SOOO amazing, and I am really looking forward to trying them out someday soon! I have one quick question regarding the instructions, though. In reading through the steps and suggestions, I have found that there is a part of a sentence missing or at least there seems to be. “Be sure to remove the pies from the pans before you add the whipped cream and chocolate ganache. The pans should easily slip off with very little effort, however if you find they’re being stubborn and don’t want…” and that is where it stops, at least on my page. So what are your suggestions for getting the crusts out of the pan if they are stuck? I may need that info! 🙂 Thanks again for all the incredibly wonderful (fat-and-calorie-free, of course! lol!) recipes that you post!